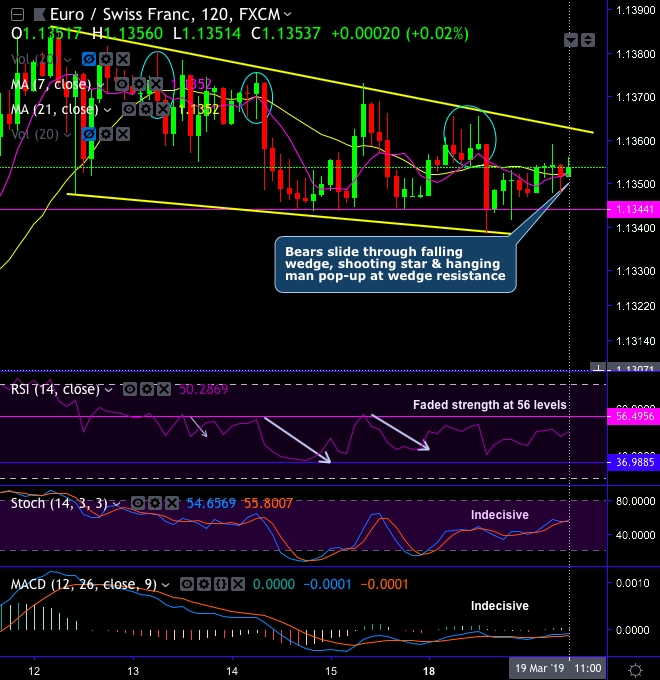 Technical Glance: EURCHF bears create falling wedge patterns on both daily plottings, where shooting star and hanging man pop-up at wedge resistance (refer circular areas in daily chart). For now, mild rallies take supports at the wedge baseline, while leading oscillators (RSI & stochastic curves) signal indecisiveness and the trend indicators are also signaling the same. Thus, for now, although buying sentiments are prevalent and more rallies in the interim trend seems to be dubious (refer daily chart). Whereas bearish engulfing candle has occurred at 1.1522 levels which have nudged price below EMAs on monthly terms. While both monthly leading oscillators (RSI and stochastic curves) show downward convergence to the prevailing price slumps that indicate the strength and bearish momentum in the selling sentiments. MACD on this timeframe, show bearish crossover that signals weakness in the major downtrend.